While most building owners don’t want to think about it, commercial buildings, newsrooms, concert venues, and other highly-populated areas are established targets for mass shootings, making security and surveillance the utmost priority in public places. The number of mass shootings incidents in the U.S. climbed to a whopping 262 yesterday according to data collected by the Gun Violence Archive. Now entrepreneurs Sonny Tai and Ben Ziomek, co-founders of Aegis AI , are using machine learning to solve this problem. The company has developed video surveillance software which uses artificial intelligence to detect firearms through security camera feeds to warn building occupants of dangerous intruders and automatically dispatch notifications to law enforcement. Tai, who grew up in South Africa, told In-Building Tech in an interview that he has been deeply impacted by the incidence of gun violence both South Africa and in the U.S. While attending an intruder training for school teachers, Tai heard one of the trainers mention that there was a need for security cameras to identify guns or knives automatically. The idea clicked, and Tai says he got to work immediately on the project. The company’s co-founder noted that its software is designed to detect “gun in hand” not concealed weapons and says it can dramatically reduce response time and provide situational awareness to first responders during an attack. “The average mass shooting takes 12.5 minutes, yet it takes law enforcement 18 minutes on average to respond. 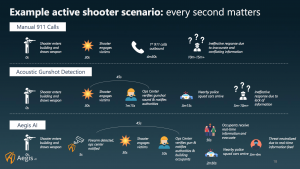 By eliminating delays and delivering accurate information to first responders during a shooting our technology can improve the outcomes in emergency situations,” said Tai. “The most terrifying thing for a law enforcement officer is entering a building knowing there are armed intruders inside but not knowing where or how many there are,” Tai added. Aegis AI’s algorithm can identify a gun within the first five seconds with 98% accuracy and was trained using more than 30,000 images of guns and knives from the web and through the company’s own database which includes images in diverse lighting and other scenarios. Once the software identifies an intruder, the information is verified by a human analyst and text alerts are sent to building owners and other parties identified on the roster. Aegis AI has been described as a game-changer in the proptech sector by MetaProp, a leading early-stage proptech investment and advisory firm that has provided $2 billion in funding to more than 90 companies in the sector. “Being a part of the MetaProp accelerator has enabled us to put our software in front of building and property owners where it can make a massive impact,” Tai said. The company’s software costs approximately $20 per security camera per month and does not require any additional sensors, or hardware and sits on top of existing video management software (VMS) systems through an open API. Aegis AI is currently integrated with the Milestone VMS, and the company says it’s in the works of partnering with Genetec and other providers. Aegis AI plans to deploy its software in five schools in Chicago and Seattle in the next few months and is also working with Haneda, Tokyo’s International Airport, to develop a computer vision detection system for guns and knives ahead of the 2020 Olympic games.